John Locke (ƿæs geboren þæs 29. þæs Ƿēodmōnðes þæs 1632. on Brycgstōƿe - cƿæl þæs 28. Ƿinterfylleðes þæs 1704. on Epinga Ƿealda on Ēastseaxum) ƿæs Englisc ūþƿita and lǣce þe nū is ān þāra brēmostena Inlīhtunge þencera and man hāteþ hine "se fæder ealdƿīslices frēodōmes þōhtes". Mid Isaace Neƿtone and Davide Hume is hē hēafodlic foregenga þǣre Bryttiscan lāre ymb andgiet fram gefēlunge. His stēormǣllic lār ƿorhte þearle in þǣm Gebanne Ānstandinge þāra Geāndena Rīca, þǣre staðolunge heora, þǣre Frenciscan Onhebbinge, and þǣm staðolungum þæs mǣstan dǣles frēodōmƿendra rīca. 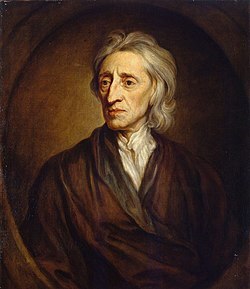 John Locke sægþ on Tƿǣm Geƿritum ymb Geƿeald þe geƿeald is synderlīce ǣfæst gif þā ƿealdenan þafien his and þā gecyndelican riht līfes, frēodōmes, and ǣhtgeƿealdes sīen aƿeardod. Man nīwanost wende þisne tramet on þǣre 05:48 tīde þæs 11 Ēastermōnaþ 2018.